In 2016, Laois and Offaly County Councils, with funding from the Heritage Council, worked with the Geological Survey of Ireland to carry out a full survey of geological sites in the two counties. This audit will now feed into the GSI’s national database of County Geological Sites, and will lead to protection of these sites and highlighting of those which are suitable for public access. 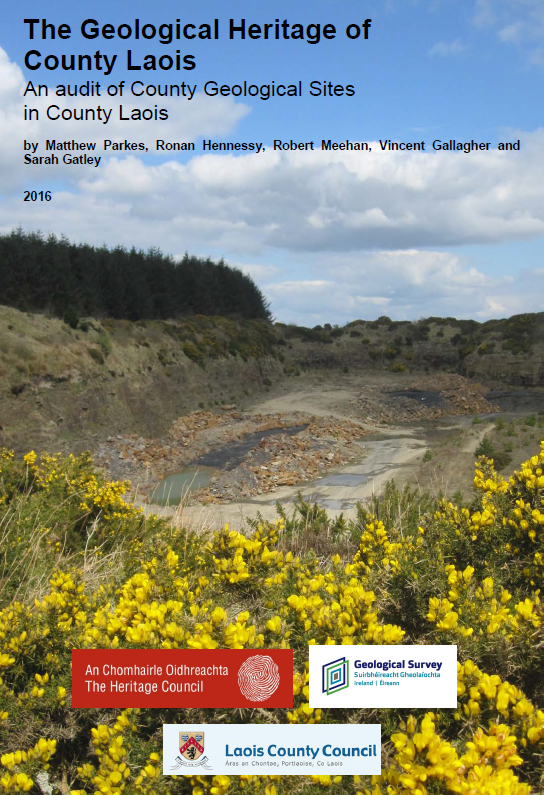 The full reports can be downloaded here, and high resolution versions of individual site reports as well as digital mapping files are available at the website of the Geological Survey of Ireland. Hard copies of the full reports are in all Branches of the Laois Library Service. This major new publication has now been launched and is available in all good bookshops priced at €40. The book is being distributed in Ireland by Argosy Books, and any book-seller should be able to order it from them. Please contact us if you have any problems ordering the book. Alternatively, it is available to order online through Amazon. Click here for a review of the Geology of Laois and Offaly in the Irish Times by Michael Viney (Saturday 18 May 2013). The last thirty years have seen much new research on the geology of Laois and Offaly, shedding new light on – and providing fascinating new insights into – the landscape heritage of the two counties. John Feehan has remained in close touch with this research since his own work on Slieve Bloom as a post-graduate student in the Department of Geology at Trinity College in the late 1970s and early 1980s. In this magnificent volume John now brings all of this research together for a general readership, and relates it to the broader cultural heritage of Laois and Offaly in a chapter that looks at Geology in our Lives. Separate chapters review the story of the two counties through the successive geological epochs that have a bearing on their evolution. A special chapter written in collaboration with Donal Daly of the Environmental Protection Agency (and like John himself a native of Offaly) looks at the Geology of Water. A special feature of the book is the six specially commissioned paintings illustrating different periods in the geological evolution of Laois and Offaly, by Offaly-based artist Jock Nicol, reproduced here as two-page full-colour plates. The paintings themselves will be exhibited during the launch of the book. The Geology of Laois and Offaly is published in hard cover format, some 400 pages long, beautifully illustrated throughout in full colour. Anyone familiar with John Feehan’s previous publications knows that they are always high quality and highly sought after – get your order in today!